Holiday Island is a lakeside community situated at the edge of 53,000 acre Table Rock Lake. We are located on the Arkansas/Missouri border 5 miles north of Eureka Springs and only one hour from Branson Missouri. The district has 27 holes of golf with the most unique driving range anywhere. Our lake, marina, campground, recreation complex with two swimming pools, tennis courts, and numerous other activities make Holiday Island perfect for a vacation or permanent residence. • Recreation Center Choosing the correct club and playing the correct shot will challenge golfers at all levels. In addition we have the most unique driving range in the state. 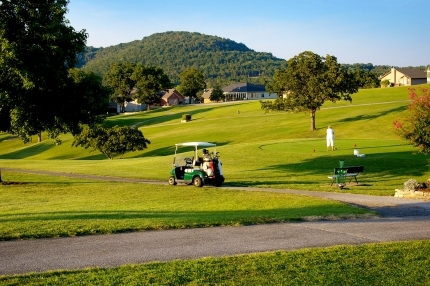 The breathtaking scenery of the Ozark Mountains and the quiet will allow you a peaceful golfing experience. We are open year round and have relatively mild winters enabling golfing every month of the year. Holiday Island offers golf tournaments for corporate or group outings and is perfect for family reunions. The championship course includes 18 holes of scenic beauty riding the crest of the oldest range of mountains on this continent. Many of the tees and greens have a panoramic view that is amazing. The course features narrow tree-lined fairways often sloping from left to right, providing a sporty type of play. The rolling terrain has been left in its natural state with the idea that golf should be enjoyed in nature’s natural setting. $99 for 4 players with cart after 11 a.m.
$39 for 2 players with cart after 11 a.m.
$89 for 3 players with cart after 11 a.m.